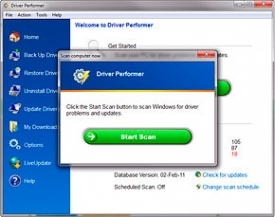 "Keep all of the drivers on your computer up to date with PerformerSoft Driver Performer." PerformerSoft Driver Performer is a free utility that manages the updating of your drivers for personal and home use. This will make sure that all of the drivers on your computer are up to date. This will ensure that your computer will work at adequate performance with the latest drivers available for the hardware that you use with your computer. This is essential for maintaining the stability and proper functionality of your personal computer. Compatible with all of the modern Windows versions out to date, PerformerSoft Driver Performer gives us a centralized mode for having everything under control and always having all the drivers of the system updated to the latest version. You will no longer have to individually monitor all of your drivers on your computer and make sure they are updated. You also don't need to use individual applications that keep track of specific drivers on your computer. This application will do all of that for you, and you can consider it an all in one application for doing the job right and automatically for you without you having to think about it. You will be able to update drivers of your video card, motherboard, sound card, local network, chipset, and more including old drivers that we don't have on any CD anymore. We all have a lot more to worry about and to make sure we always have up to date drivers is something that is often forgotten, which is where PerformerSoft Driver Performer comes in to play. This will manage that all for you so you no longer have to. We believe applications like this are essential when using a Windows computer, especially since it does a (typically) different job for you without you having to do it yourself.